Coast Bike Share, Tampa Bay’s bike rental service, has reached 10,000 members after less than a year in business. 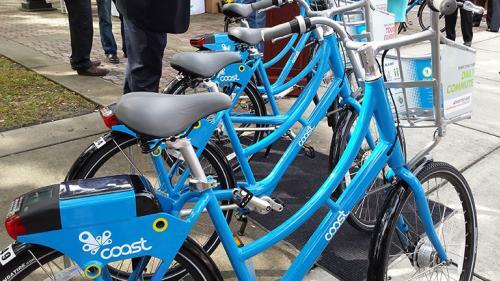 Coast Bikes’ sturdy, blue machines can be found at stations throughout downtown. With new bike lanes and paths, they make it easy to move around Tampa Bay, whether you’re running a quick errand downtown or exploring the Tampa Riverwalk! All you need is a smart phone and a credit card to get started. The Coast Bikes app gives you a day filled with adventures in Tampa Bay. Coast Bike Share has 30 stations spread across downtown, Ybor City, and Davis Islands. It’s adding new stations on the University of South Florida campus north of downtown as well- so there is more to explore! After only being open for seven months, Coast Bike Share riders have traveled 70,630 miles so far! That&apos;s like biking around the earth nearly three times! It’s also a great way to exercise. Eat a big lunch? Bike off the calories riding that pretty blue bike. It&apos;s also a great way to incorporate a workout into your daily life. So no more excuses on why you don’t have time to work out because now you do. And who wouldn’t want to beat the heat while taking a breezy bike ride downtown? It&apos;s easier and more fun than walking. To celebrate their 10,000th member, the Coast Bike Share folks are offering a special deal: get a monthly membership for $15 this month using promo code VisitTB15. That gets you 60 minutes of bike riding a day for a month! They’ve also lined up activities each weekend this month to celebrate biking in Tampa Bay. Do the words “pool party” get you pedaling? Or maybe “pedals and pints?” Grab a blue bike and join the fun!